Blog — Blue Sky Photography, Inc.
Somebody has to make the brushes that clean your car at the carwash. We spent a day shooting a carwash door that moves up and down quickly to keep the heat in during the winter months, and some brushes. The door was beautiful, but I took a liking to the brushes. Red, graphic, and oddly organic looking, this one reminds me of a sea creature. All in all, it was a great day with a great client, excellent art direction and a stellar crew. We recently finished a project photographing the Litter-Robot 3 Connect in grey. It's always a pleasure to work with this company. It's a great crew and a great product – such a great product I gifted a Litter-Robot to my son and daughter-in-law for Christmas last year. The robot keeps their tiny Brooklyn apartment odor free. Their cats, Andie and Dosa, love to sit and watch it rotate! How to communicate hand-craftsmanship in a photograph? Hands! Specifically, the hands of the maker. I’ve been making photographs of Richard’s hands with his jewelry for over twenty years. I love the juxtaposition of his dirty working hands and the intricate shiny metal. The contrast between Richard’s dark hands and the bright jewelry makes the product pop. I’m always interested in your thoughts. It’s hard to believe that it’s been a year since the the last “No-Show Black Tie” fund raiser. The Bottomless Toy Chest delivers art projects, crafts and interactive games to hospitalized pediatric cancer patients. Toys are the subject again. It sorta fits. This is a Mr. Potato Head year. It was lots of fun playing toys and taking photos. We should all be heading over to The Bottomless Toy Chest do donate. Do it! I love photographing shiny things. Kinda doesn't matter what it is. Cars, jewelry, industrial parts or tools, as long as it’s Shiny. I photographed this tap on a white background and put in the blue handmade paper in post production. I’m always interested in what you think. Who knew surgeons used torque wrenches? I don’t think about it that much, but I guess it makes sense. Surgeons are sort of body mechanics. True, the stakes may be higher than a brake job on your car, but a bad brake job could be fatal too. Anyway, we spent the day working and collaborating with an excellent art director and ended up with a bunch of nice images and had a good time as well. Let me know what you think. In the commercial photography world, schedules and deadlines are paramount. We are usually awarded photography projects a few days or a couple of weeks in advance, but for this project for WABCO, we were requested to shoot with less than four hours advance notice! Fortunately I had no other photography bookings for the day so I was able to pack my gear and rush off to location. The directives for this shoot were to photograph a WABCO truck in an empty lot in the correct perspective to strip into this stock photo background the client had purchased the rights to that very same day. After some late night retouching, I was able to deliver the finished project the next day in order for the client to meet their deadline. Here in Detroit we have Coney dogs, Coney Island hot dogs. Like our neighbor to the North's dish of poutine, there is no pretense of health. I suppose you could argue hot dogs themselves are not all that healthy. But when you smother them in chili, mustard and onions you reach a new level. And, like doughnuts, bacon, and all unhealthy foods, they are delicious. Chicago Dogs on the other hand at least have the air of being healthy, with their vegetables, pickles, and the like. Lots of fun to shoot with a super client and crew. Go ahead, guess what this is. Stumped? It’s sausage casing! Really! I just love the things I shoot. I hope the affection comes through in the photographs. Photographers have been shooting circles for ages. Usually it’s pipe, maybe with a couple of people wearing hard hats in front. I was drawn to the the luminescence of the casing. Less and less light getting through to the lower tubes. I like finding beauty in unusual places. Visibility is important if you’re driving a fork truck. Vision is important in many jobs. I am generally not a fan of “straight on” shots, but in this case it’s kind of dramatic. The diagonals provided by the red forks are dynamic and the strong verticals of the mast create a sense of strength. And it all frames the eyes. Please let me know what you think. Ordinarily, my job is to grease the wheels of commerce. Not a bad thing, but not quite like Mother Teresa. My studio neighbor is The Bottomless Toy Chest. They take toys to kids with cancer in hospitals. When Micky came by and asked me if I could take a picture of trolls, I was all in. When I found out that the designer / art director was Cindy Sikorski, I was truly excited. On the shoot day Micky and Cindy did the styling, it’s tough to get those tiny clothes to look good on those inflexible little bodies. They did the hair too! It was loads of fun, and profoundly worth while. The biggest of these little steel balls is about a millimeter in diameter, about the thickness of a dime. It’s called wire cut shot. It's used as in industrial processes. I had to level the table so it wouldn’t all roll away. It’s challenging to get them into the shape you want and make it look natural and random. I love the little glimpses into otherwise invisible areas that commercial photography provides. I was photographing jewelry for a catalog with my friend Richard when he slid some small rings onto a bit of rolled up paper. It didn’t work for the catalog we were shooting, but I thought it looked pretty cool. I enjoy spontaneous moments like that one. 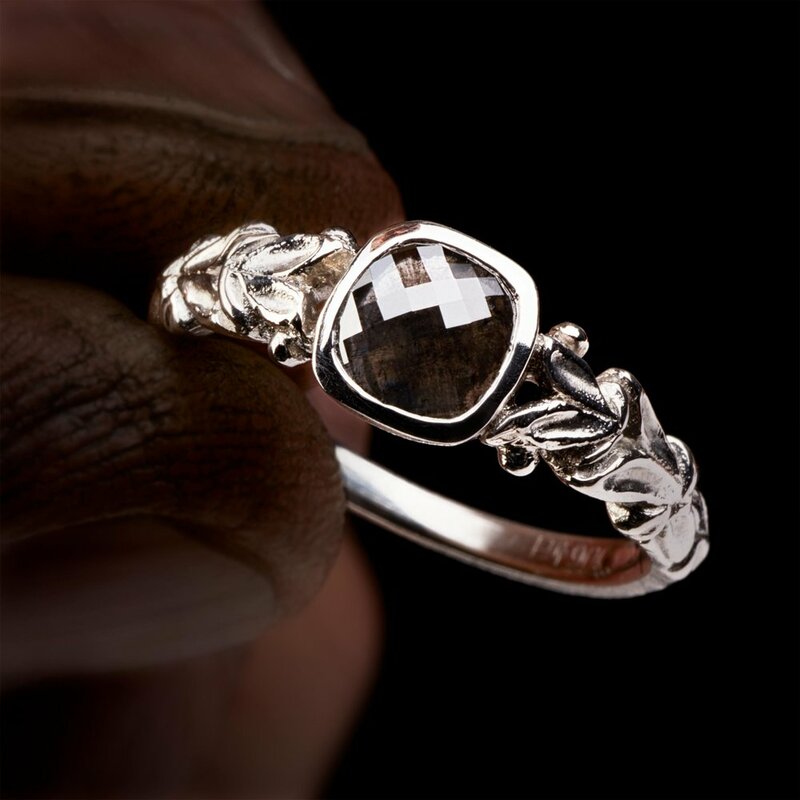 Because Richard created the jewelry, he has ideas about what it should look like in 2 dimensions. Collaborating on projects like this one is a highlight of my job. Photographing very small things can be challenging. The product in this photograph is an abrasive, but to be honest, I don’t know how it is used. I imagine that it’s similar to sand blasting. The largest of the stainless steel balls is about one millimeter in diameter. For comparison, a BB is about 4.5 millimeters in diameter. So these are pretty small. As always, I am interested in your thoughts and comments. Every now and then we need to photograph large products. Fork trucks are not the largest product we’ve had in the studio. We’ve had large trucks, turf maintenance vehicles, salt spreading equipment and truck bed liners in the studio too. These fork trucks are fun to photograph because of their excellent industrial design. Please, let me know what you think! I was recently awarded a project to photograph professional models for a medical device maker in Michigan. Stryker is a Fortune 500 company whom I've worked with numerous times. This particular shoot was done in studio with an emphasis on building a library of images the client could use for future marketing needs. It was an enjoyable photography session, as our talent pool was exceptionally good. Likewise, I had great art direction and a knowledgeable staff that knew the medical nuances of surgical wear. All in all, it was a great team effort. Circles are delightful design elements. The fact that these are functional is a bonus. The trick to images like this one is to make it feel like you just grabbed a snapshot of some parts in a barrel. The reality is quite different: cleaning tiny parts, moving them around with tweezers and carefully adjusting the lighting takes hours.